Elysha is a certified Kettlebell Kickboxing™ Instructor (KBIA), currently teaching a popular Kettlebell Kickboxing programme to secondary schools (ages 12-18) throughout Auckland, New Zealand. Elysha is a certified Personal Trainer (NZIHF Level 3 & 4), Thump Boxing & Kickboxing Instructor and Women’s Powerlifting coach. 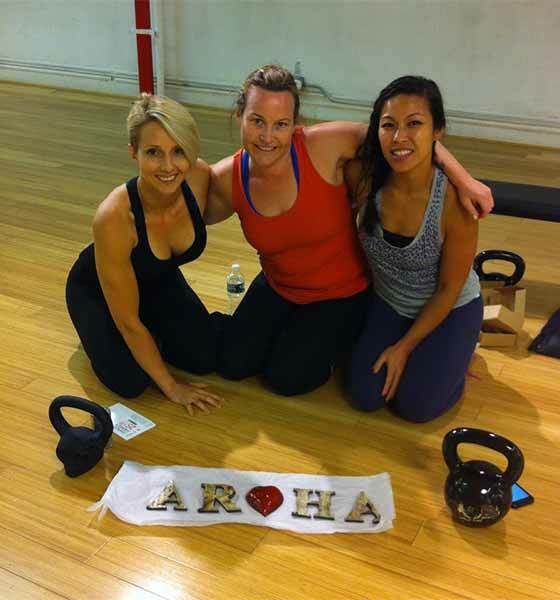 In 2015 she travelled to NYC to train with Dasha to become New Zealand’s first Kettlebell Kickboxing instructor. Elysha became a personal trainer after losing 40kg (88lb) on her own health and wellness journey. Having experienced first hand the psychological and emotional challenges often associated with weight loss, she is able to empathise with others embarking on their own journeys. Guided by the words “What i learn, I can teach”, Elysha is using her experience to educate and empower women through wellness and to help them create healthy, sustainable futures, not only for themselves but for their families and future generations to come (mind, body and soul). Elysha offers a mobile coaching service and is available for private one-on-one and small group training sessions throughout Auckland. My daughter. Everything i do and everything I am is because of her. She is my greatest gift and has been and continues to be my ultimate teacher, in love and in life. Women are a constant source of inspiration to me. Their strength, their selflessness, their natural ability to get sh’t done. Women have this innate willingness to be vulnerable when they can see another women needs “permission” to be. This inspires greatness. I love seeing women succeed. And i love hearing women sharing their successes and seeing their “sisterhood of strength”, the women they choose to surround themselves with, celebrate these successes as if they were their own. No envy, no comparison, just love. I have so many! But my all time favourites would have to be the single arm high pull and variations of the leopard. Both are so versatile. I love stacking movements around the high pull and creating flows. The leopard variations are deceitfully challenging, providing maximum bang for your buck as well as being funky and fun! The best part about my class is.. it is whatever you need it to be. Do you want to be taught and learn so as to create independence? Awesome, i’ve got you. Do you want to switch off, have a little fun and work out and work off the stresses of your day? Awesome, i’ve got you. Do you want to be part of a community of like-minded, wellness focused individuals who are almost like an extension of your own family? Awesome, i’ve got you with that too. It’s all there, it’s totally up to you to take what you need and disregard what you don’t.